This year, 15 winners earned the coveted award and were acknowledged at Toyota’s National Dealer Meeting in Phoenix, Ariz.
"The President’s Award provides TMHU with a way to recognize our dealers that went above and beyond to demonstrate top quality service and support," said Jeff Rufener, president of TMHU. 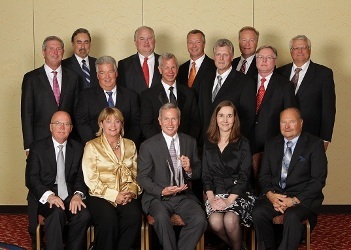 "The winning dealers clearly exemplify Toyota’s dedication to their customers and set the bar for industry excellence." The President’s Award, TMHU’s highest honor, has been awarded to select dealers since its inception in 1990 to acknowledge their outstanding business accomplishments. To demonstrate the company’s appreciation, each President’s Award recipient received an exquisite Tiffany & Co. crystal award. TMHU also is hosting a trip to the Bahamas for the award recipients.